Angela Catic, M.D., speaks at the Geriatric Update about tube feeding versus hand feeding with advanced dementia patients. 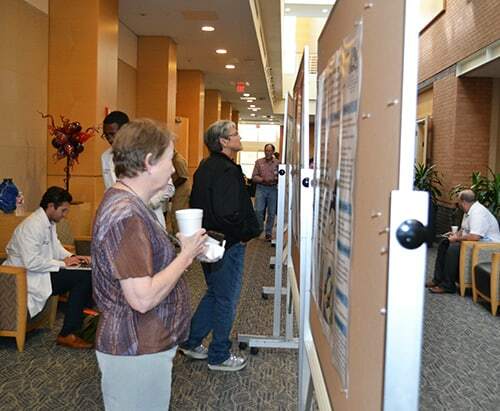 During a conference break, attendees at the Geriatric Update examine some of the 16 research posters on display at the Reynolds Institute. Oct. 5, 2018 | In caring for a patient with advanced dementia, hand feeding can give them something much more than simply nutrition near the end of life. 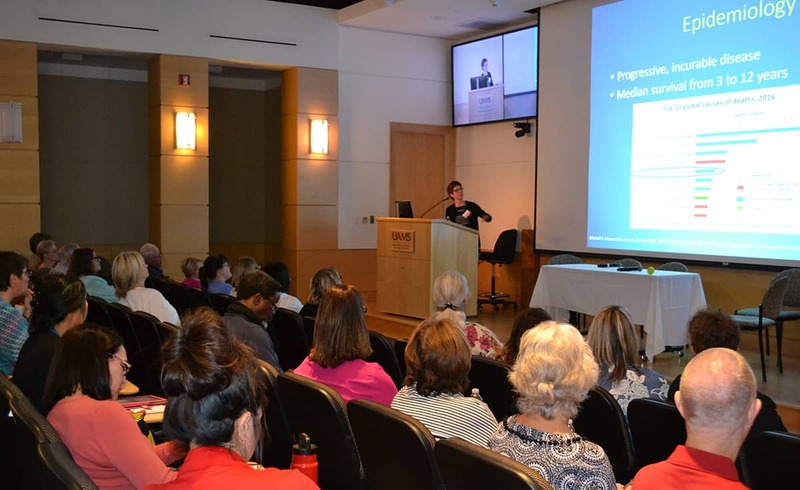 It can give them a feeling of comfort, support and contentment, Angela Catic, M.D., said to the audience at the 19th annual Geriatric Update and Long-term Care Conference held Sept. 20-22 at UAMS. Catic delivered the Arkansas Medical Society Distinguished Lecture at the conference. She is an assistant professor in the Baylor College of Medicine’s Department of Internal Medicine, Section of Geriatrics in Houston. Throughout the three-days, conference speakers, presentations and expert panels covered a range of important topics from obesity and muscle loss during adult aging and dietary trends to treating clostridium difficile and antimicrobial stewardship. More than 120 people attended the conference, which was sponsored by UAMS, Arkansas Medical Society, Arkansas Geriatric Education Collaborative, Arkansas BlueCross BlueShield and Arkansas Health Care Association. The conference has also been supported annually by Jeanne Wei, M.D., Ph.D., executive director of the UAMS Donald W. Reynolds Institute on Aging, to provide the latest information to physicians and other health professionals, as well as caregivers to the aging population. 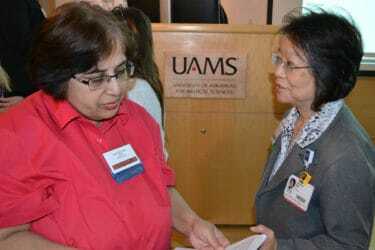 Gohar Azhar, M.D., left, confers with Jeanne Wei, M.D., Ph.D.,, between speakers at the Geriatric Update. Catic said several research studies have shown that for a patient with terminal, advanced dementia, hand feeding is preferable to tube feeding (which is using a medical device to provide nutrition through a tube inserted through the esophagus or an abdominal incision to the stomach or small intestine). While the use of the tube feedings can be beneficial in cognitively intact patients who need it short-term to help them heal during an acute illness, it does not benefit those with advanced dementia. ”There is no evidence to support the use of feeding tubes in our elders with terminal, advanced dementia to reduce aspiration, improve nutrition, prevent or heal pressure ulcers, improve survival rates or increase their comfort,” she said. Tube feeding does not reduce the risk of aspiration, the breathing in of food particle or fluids into the lung, and even can slightly increase the risk of pressure ulcers or bed sores. According to one study, 47 percent of Emergency Department patient visits by patients with advanced dementia were because of complications due to tube feedings. Although it is true that hand feeding can take up to 40 minutes per meal, which is too long for the staff in most skilled nursing facilities, the practice offers family members, friends and volunteers a wonderful chance to help with caring for the patient and loving on them, Catic said. Research is ongoing at UAMS and around the nation to find early indicators of dementia before they become clinically evident so that treatment can be initiated. There continues to be optimism in the progress being made, and efforts to delay or prevent dementia through a healthy lifestyle, exercise and diet have already yielded promising results. “What is good for the cardiovascular system is also good for the brain,” Wei said. A number of geriatrics research posters were on display at the conference. Many attended from out of state, including some who have participated for as many as 13 consecutive years.